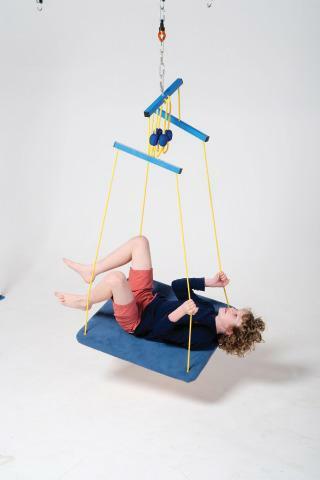 Our Platform Swing is perfect to get the vestibular input you need. Adjust the ropes to accommodate everyone. Smooth ropes and microfiber surface for comfort. Weight limit: 199 lbs. Indoor use only. Attachment hardware not included. We recommend our Quick Release Clips (8TQRC). Frame sold separately. CHLOE'S PICK - "I love swinging on this flat surface. I can sit up, lay down, etc. It’s versatile. I can even put the inflatable tube swing on top of it and swing, I call this the "super calm swing"! This swing is a huge Chloe favorite!!!"